This orange pineapple fluff salad pairs perfectly with ham or any other meats on the dinner table, a holiday brunch spread or even as a light dessert! 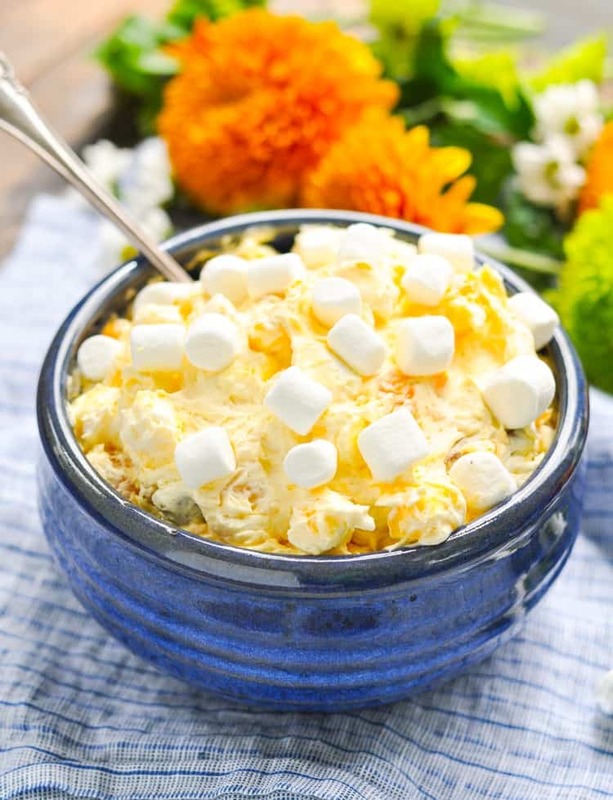 This recipe for Orange Pineapple Fluff Salad was originally posted in June, 2013. The photos were updated in October, 2017. I’m always looking for new ideas for quick and easy side dishes, and this one is delicious! The Orange Pineapple Fluff Salad pairs perfectly with ham or other meat on a dinner table, holiday brunch spread, or even as a light dessert. Have you ever tried a classic Watergate Salad? It’s a sweet dish that’s a pale shade of green — thanks to the pistachio pudding mix that’s combined with fruit, Cool Whip, and other tasty ingredients. 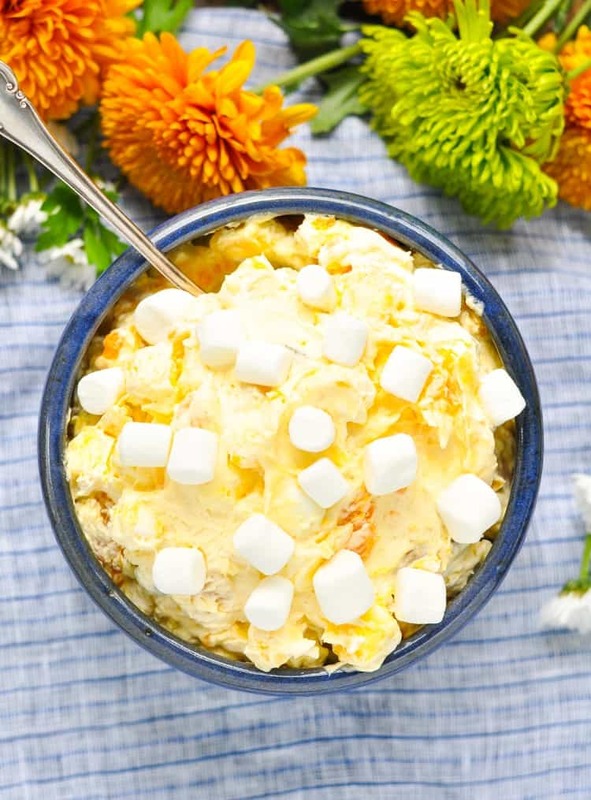 The original Watergate Salad inspired this orange-pineapple twist, largely because I was looking for an alternative to that strong pistachio flavor. My kids just don’t always love that taste, so this mild vanilla-based version has been a HUGE hit! 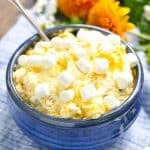 As someone who loves a sweet-and-savory combination, I think this fluff salad pairs perfectly with roasted turkey or carved ham for dinner. 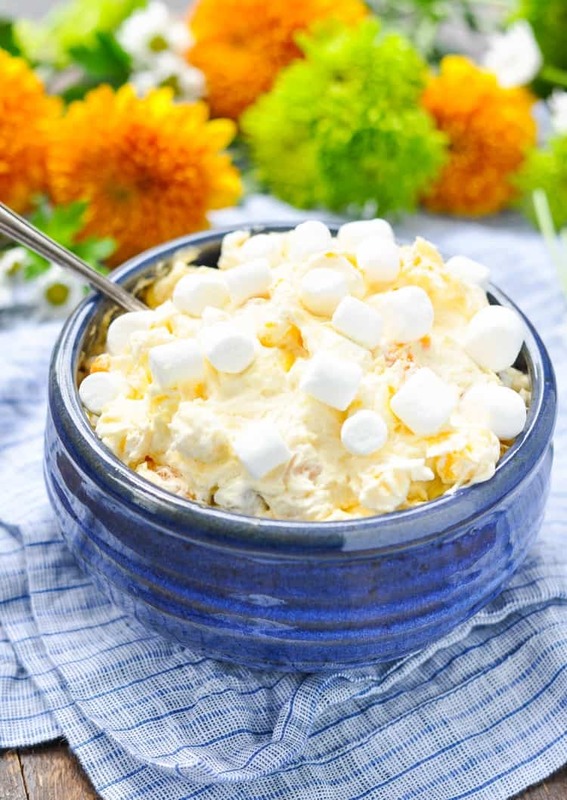 It reminds me of the ambrosia salad that I grew up with! Best of all, it’s easy and versatile! 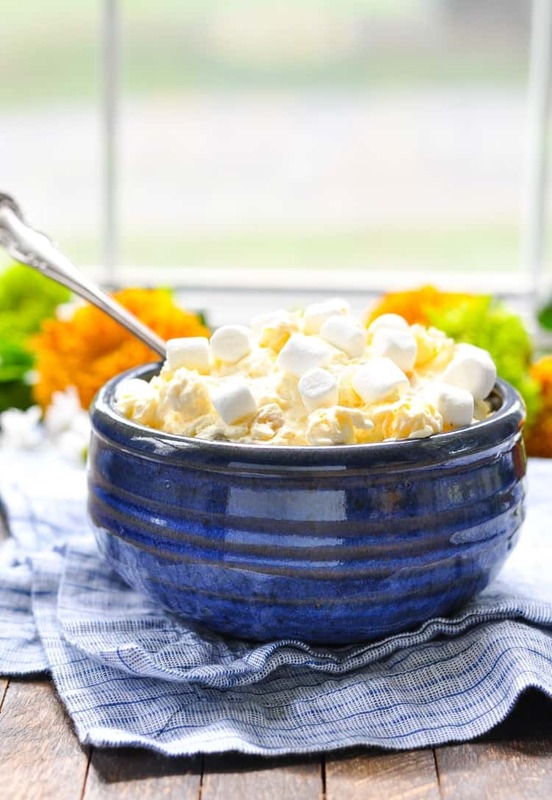 I consider a bowl of this Orange Pineapple Fluff Salad the perfect potluck food — because everyone loves it and it goes with just about anything! Plus, you can prepare this fluff salad in advance and just keep it in the refrigerator until you’re ready to eat. It makes parties, holidays, or quick weeknight dinners so darn easy! I served this on our Easter table this year because the sweet salad was a perfect contrast to the salty Kite’s Country Ham that we enjoyed with biscuits. The salad is a special and fun way for the kids to eat their fruit, too! And if a sweet fruit salad isn’t your “thing” for dinner, then it’s also a great brunch option or a light and refreshing dessert. See what I mean? It’s versatile and appropriate for just about any occasion! 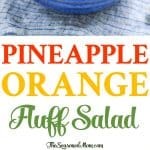 If you’ve tried this Orange Pineapple Fluff Salad or any other recipe on The Seasoned Mom then don’t forget to rate the recipe and leave me a comment below! You can also follow me on Facebook, Twitter, Instagram and Pinterest to see what I’m getting up to. Stir together first 5 ingredients in large bowl until well blended. If you want to lighten this up a bit, you can use sugar-free instant pudding mix and a lighter Cool Whip such as Cool Whip Free. Thanks, Marissa! And thanks for the invitation! This wasn’t a very tasty salad. A little blah…so I added 1/2 C. Coconut, doubled the Mandarin Oranges, used Pineapple Tidbits instead of Crushed Pinapple and also 2 Tablespoons of Orange Jello right out of the box (not mixed with water)!!! Is it okay to make this a few days in advance? It was excellent, but I also left out the pecans and added coconut. That was excellent too. Great! So glad that you enjoyed it, Barbara! Do you make the pudding or just use the dry mix? Excellent! I added a handful of shredded coconut. My new favorite fluff salad. Sounds perfect, Marla! So glad that you enjoyed it as much as we do! Your recipe was not the same as pictured. You don’t have the mandarin oranges . I have a a 1.5 oz of vanilla instant pudding. You have listed a 3.40z on picture recipe. So what is correct? Hi, Cindy! I’m not sure that I understand your question. The mandarin oranges are pictured and they’re listed as the first ingredient in the recipe. My recipe calls for a 3.4 ounce box of the vanilla pudding, so that’s what you need. I’m not sure why you have a 1.5 ounce box — is your box a sugar-free version or some other brand or variety? I wonder if she is using pudding cups. Could explain the size.